Western Culture, sometimes equated with Western Civilization, Occidental Culture, the Western World, Western Society, and European Civilization, is a Term used very broadly to refer to a Heritage of Social Norms, Ethical Values, Traditional Customs, Belief Systems, Political Systems and Specific Artifacts and Technologies that have some Origin or Association with Europe. The Term also applies beyond Europe to Countries and Cultures whose Histories are strongly connected to Europe by Immigration, Colonization, or Influence. - "VOLTAIRE - Questions Sur l'Encyclopédie" (VOLTAIRE - Questions About The Encyclopedia), presented and annotated by Nicholas CRONK, Christine MERVAUD & Gillian PINK. Published in FRANCE by Robert LAffont - Bouquins. Voltaire was a French Enlightenment Writer, Historian and Philosopher famous for his Wit, his Criticism of Christianity, especially the Roman Catholic Church, and his Advocacy of Freedom of Religion, Freedom of Speech, and Separation of Church and State. Voltaire was a Versatile and Prolific Writer, Producing Works in almost every Literary Form, including Plays, Poems, Novels, Essays and Historical and Scientific Works. He wrote more than 20,000 Letters and more than 2,000 Books and Pamphlets. He was an Outspoken Advocate of Civil Liberties, despite the Risk this placed him in under the Strict Censorship Laws of the Time. As a Satirical Polemicist, he frequently made use of his Works to criticize Intolerance, Religious Dogma and the French Institutions of his Day. In the Mid-1700s, a pair of French Writers set out to organize all Human Knowledge. They called their Project the "Encyclopédie". Denis Diderot was the Driving Force behind the Project, and was accompanied by Jean le Rond d'Alembert until 1759. Diderot's Encyclopedia was almost Insanely Vast. It incorporated more than 70,000 Entries, including Original Work from Voltaire, Rousseau, and other Luminaries of the French Enlightenment. Many Writers contributed Massive Amounts of Labor, almost all of it Unpaid, spanning Three Decades. "l'Encyclopédie", ou "Dictionnaire raisonné des sciences, des arts et des métiers" was conceived of as a Vast System that would classify, hierarchize, and comprehend Human Knowledge. It aims to be a Reference Work for All Topics related to the Arts and Sciences, and to be a Militant Undertaking, spreading Enlightenment Ideas in order to found a New Order of Things. This BOOK "Questions Sur L'Encyclopédie" stands as Voltaire’s Longest Work, and yet it is One of his Least Known. In this Complete Critical Edition, we can explore fully for the First Time the Relationship between the "Questions" and its Named Object of Enquiry "Diderot and D’Alembert’s Encyclopédie". We can also assess the Complex Techniques by which Voltaire fashions New Material through Extensive Copying and Borrowing from his Earlier Publications. The Work as a Whole, written and revised principally between 1770 and 1774, is a Compendium of Voltaire’s Views on a Broad Range of Subjects including Religion, History, Art and Literature. It varies greatly in Style and Tone. It casts New Light on Familiar Themes (Justice, Humanity and Tolerance) and explores many New Ones. 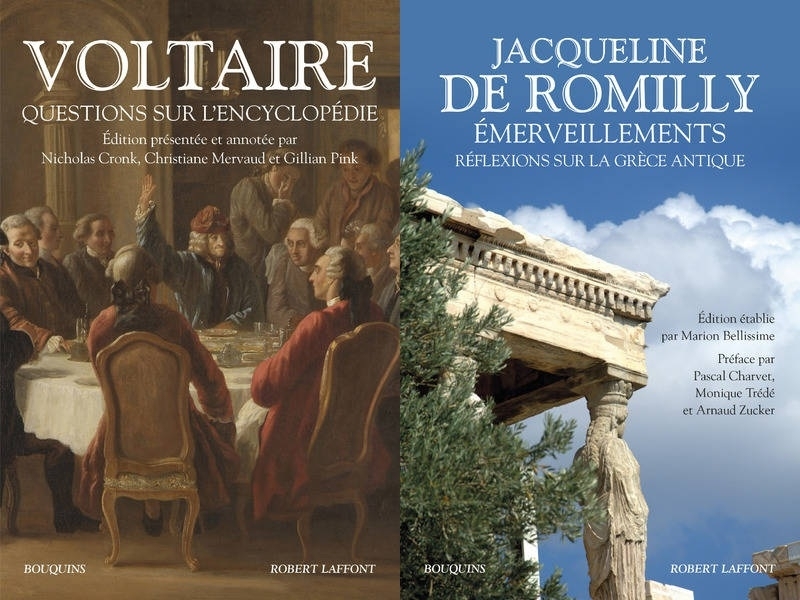 - "Emerveillements, Réflexions sur la Grèce Antique" (Wonders, Reflections on Ancient Greece) by Jacqueline De ROMILLY, compiled by Marion BELLISSIME with Preface of Pascale CHARVET, Monique TREDE and Armand ZUCKER. Published in FRANCE by Robert Laffont - Bouquins. Jacqueline Worms de Romilly was a Franco-Greek Philologist, Classical Scholar and Fiction Writer. She was the First Woman nominated to the Collège de France, and in 1988, the Second Woman to enter the Académie Française. She is primarily known for her Work on the Culture and Language of Ancient Greece, and in particular on Thucydides. Born in Chartres, Eure-et-Loir, she studied at the Lycée Molière. As a Schoolgirl, she became the First Female to qualify for a Prize in the Concours Général, taking the First Prize in Latin to French Translation and Second Prize in Ancient Greek in 1930. She then prepared for the École Normale Supérieure at the Lycée Louis-le-Grand. She entered the Class of 1933 of the ENS Ulm. She passed the Agrégation in Classics in 1936 ; however, because she was of Jewish Ancestry, the Vichy Government suspended her from her Teaching Duties during the Occupation of France. She became a Doctor of Letters at the University of Paris in 1947. Her Doctoral Thesis, a Treatment of Athenian Imperialism in Thucydides, was published as "Thucydide et l'Impérialisme Athénien", and subsequently translated into English as "Thucydides and Athenian Imperialism". After being a Schoolteacher, she became a Professor at Lille University and subsequently at the Sorbonne, between 1957 and 1973. She later was promoted to the Chair of Greek and the Development of Moral and Political Thought at the Collège de France (the First Woman nominated to this Prestigious Institution). In 1988, she was the Second Woman (after Marguerite Yourcenar) to enter the Académie Française, being elected to Chair #7, which was previously occupied by André Roussin. In 1995, she obtained Greek Nationality and in 2000 was named as an Ambassador of Hellenism by the Greek Government. A One-Time President of the Association Guillaume Budé, she remained an Honorary President until her Death at a Hospital in Boulogne-Billancourt at the Age of 97. After having only received Baptism in 1940, she fully converted to Maronite Catholicism in 2008, aged 95. 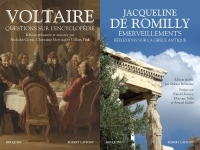 This BOOK is the Compilation of some Previous Books she wrote : Hecor - Homère - l'Amitié de Giraudoux avec l'Hellénisme : Elpénor - L'Humanité d'Homère et les Humanités - Alcibiade - La Grèce Antique à la Découverte de la Liberté - La Littérature, ou le Passé Vivant - La Douceur dans la Pensée Grecque - "Patience, Mon Coeur !" - Ne me dis pas comment cela finit... Réflexions sur la Tragédie Grecque. Examples of Previous Books in English Version : Thucydides and Athenian Imperialism - Time in Greek Tragedy - Magic and Rhetoric in Ancient Greece - The Rise and Fall of States According to Greek Authors - A Short History of Greek Literature - The Great Sophists in Periclean Athens - The Mind of Thucydides.